It's that time of year when warm days are followed by cool, dewy evenings that promote weed growth. It's during these days that a weed, known as Goose Grass, explodes onto the scene, showing up in your lawn. With over 50,000 seeds being produced by a single plant, goose grass can get out of control quickly. In this article, we'll take a look at how to spot this weed, the lawn conditions it loves, and how to get rid of it. Goose grass, also known as "silver crabgrass," is a late-Summer, early Fall lawn weed that thrives when soil is warm (60-70 degrees) and the evenings are cool and moist. Goose grass is most noticeable because it grows in a "wagon wheel" shape and it's stems get whiter towards the center of the plant. A prolific seeder, each plant is capable of producing more than 50,000 seeds. Because of such a large amount of seeds, once you start to have goose grass, it is very difficult to get rid of. Why Does it Grow in my Lawn? Goose grass grows in your lawn often popping up in areas that have compacted soil, and little grass. It's not a question of if your lawn has goose grass seeds in it or not; because at 50,000 seeds a plant, the chances that your soil does have seeds in it are pretty good. So if it's already in your soil, how do you keep it from germinating? Proper aeration of compacted soil encourages lawn growth that chokes out potential weeds from developing. This is true with goose grass, with seedlings dying because they can't compete with established turf. 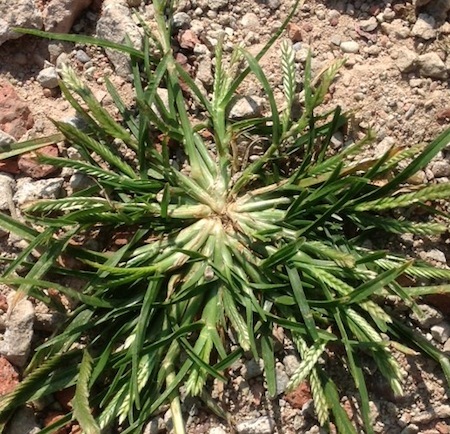 If goose grass is currently a problem in your lawn, there are a few things you can do to get rid of this pesky weed and prevent it from rearing it's ugly head again in your lawn. Control with Postemergent - a postemergent product, such as baracade, can kill these weeds. Postemergents are an effective way to stop the spread of this pesky weed. Perform an Aeration - killing the adult weed is one thing, but preventing future outbreaks is another. That's why an aeration is your best bet for controlling future outbreaks by improving the density of your turf, and encouraging growth in areas where soil is compacted. Prevent with a Preemergent - the best offense is always a good defense! That's why a preemergent herbicide can help prevent goose grass from germinating in the future. A Good Fertilizer Program - keeping your lawn healthy also helps keep your turf dense and full, preventing goose grass seedlings from developing. That's why a good lawn care program that provides a constant level of food throughout the season will help keep your lawn looking great all season, and more importantly, weed free. Need More Fall Lawn Care Tips? Fall is the perfect time to start repairing the damage to your lawn caused by the summer months here in Cleveland & Columbus. That's why Weed Pro is here for you every step of the way with our really great "Ultimate Fall Lawn Care & Landscape Guide" that will have you steppin' in the right direction! The best part of this guide is that it's yours absolutely FREE just by clicking the button below and filling out a short form! So get started repairing your lawn today, so it looks great for next season!